The fur can handle fluid quite easily and does not hold a lot of dirt. The maintenance is easy; if you brush it regularly with a good hairbrush, the fur will stay in good condition and your house will stay fur-free. Austere feeding, of good quality, will result in a slender muscular dog, who likes to be active. Depending on the gender and the size a Kooikerhondje is not supposed to weight more than 9-11 kilograms. 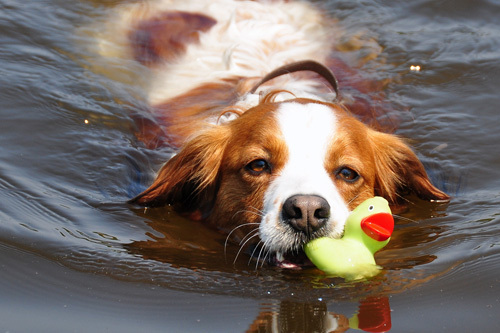 A Kooikerhondje is a working dog. This means that he needs a lot of movement. A dog which sits at home all the time and never comes any further than the back yard will have a huge physical and mental arrears, because he does not get the opportunity to use his muscles to the fullest, to take initiatives or to make proper use of his ability to smell. 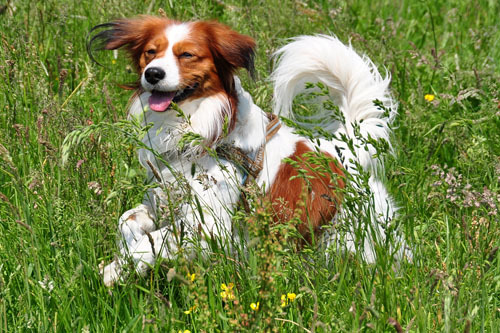 A Kooikerhondje lives on average 10-14 years. During this period its owner is responsible for the well-being of the dog. The owner has to make use of the intelligence of the dog, his attention, his zest for work and the strong bond with his master, by spending a lot of time with the dog. Teach the dog some tricks, play seek and retrieve games with him in the garden or during a long walk. Games stimulate the curiosity of the dog and its ability to learn and confirm the bond between the dog and his owner.